FOSTER CITY, Calif. – Feb. 11, 2019 – Qualys, Inc. (NASDAQ: QLYS), a pioneer and leading provider of cloud-based security and compliance solutions, today announced general availability of its groundbreaking global IT Asset Inventory (AI) Cloud App, which provides Security and IT teams a single source of truth to quickly analyze their complex and interconnected global IT environments, and collaborate on critical security remediation efforts. Digital Transformation creates complex IT infrastructure that challenges organizations to accurately assess their networks and quickly remediate risk. 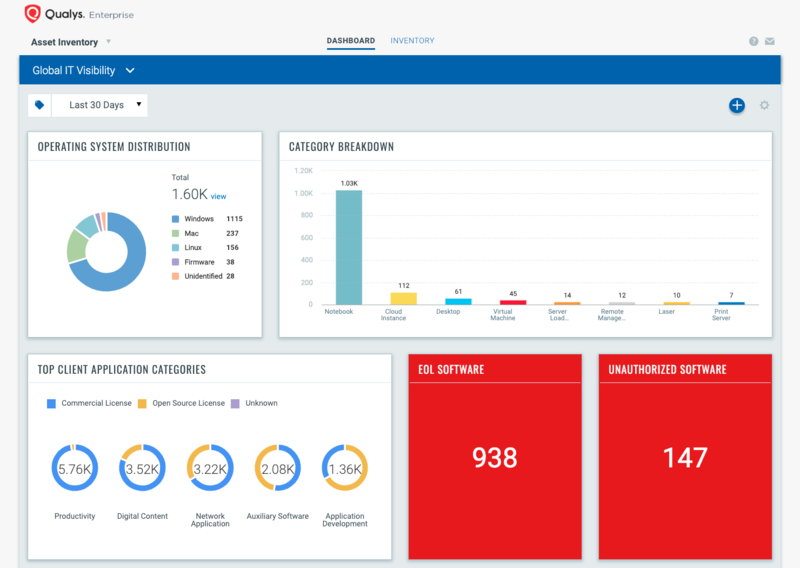 Using a combination of Qualys sensors —Cloud Agents, scanners and passive network sensors— Qualys AI collects and analyzes data about assets across hybrid environments, and delivers up-to-date, comprehensive and continuous information about those assets and their security and compliance posture. Such capabilities allow Security and IT teams to quickly identify critical or potential risks, such as end-of-life software, and work together to remediate them. Global IT Asset Inventory delivers unprecedented visibility and a single source of truth for Security and IT Teams. For example, a Fortune 50 retailer now gains full visibility into their global corporate data centers, multi-cloud environment as well as stores and warehouses, providing them new insights into their complex global environment, and revealing hidden risk from unknown devices or end-of-life technology. With increasing risks, regulations on security and privacy, and software licensing audits, the role of IT asset management is neither optional nor the concern of IT teams alone. Industry regulations and standards such as PCI DSS, HIPAA, GDPR and FedRAMP require organizations to continuously identify, track and secure assets storing sensitive data. helping ensure no unauthorized assets are spun-up in production. detecting when applications outside their whitelist are running. alerting teams when vulnerable, end-of-life or unlicensed software is present. Qualys AI continuously gathers asset telemetry to identify and categorize devices, hardware, and software. Both IT and Security teams can then drill down into the resulting asset details and risk information to make informed business decisions. The certified Qualys CMDB Sync App for ServiceNow supports 2-way synchronization of asset information. Qualys AI is generally available today starting at $15 per asset per year. This entry was posted in and tagged AI, Asset Inventory, Cloud App, cloud-based security, compliance solutions, IT Infrastructure, Qualys. Bookmark the permalink.